on my honor...: Pumpkin inspiration! Every year I consider carving or painting a pumpkin and creating a little Halloween vignette on my tiny porch, and every year I reject the idea because without trick-or-treaters, what's the point? Usually, I satisfy my craving for Halloween decor by tricking out my mantel with creepiness, but if I had a yard or a bigger porch or any trick-or-treaters at all, I'd be making these pumpkins like crazy. 1. 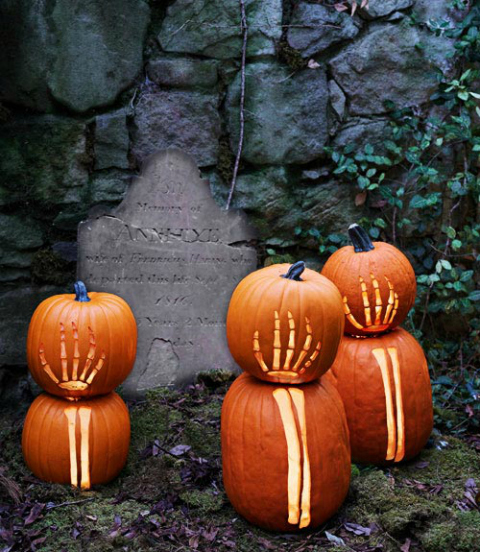 Skeletal hand pumpkins by Country Living! 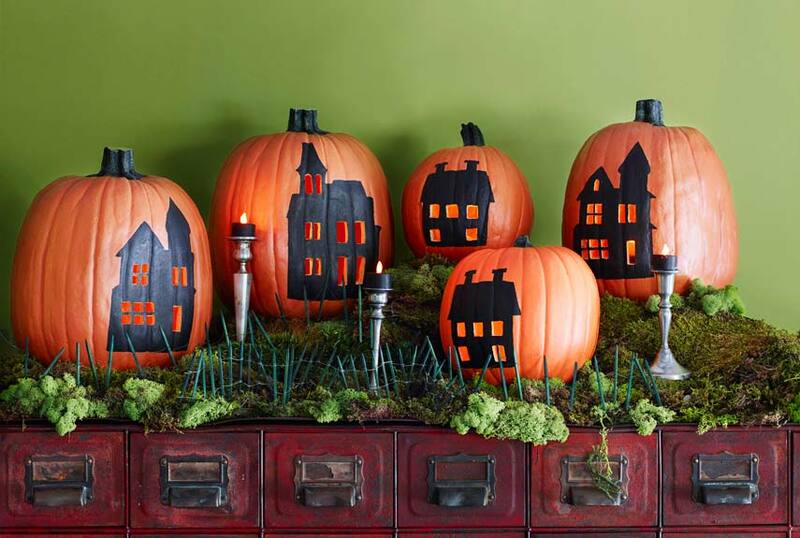 In my book, these are the coolest possible pumpkins ever. I mean, just look at them! Tremendous. Instructions can be found on the Country Living website. They also have a bunch of spooky templates for all your Halloween decorating needs. In the world of pumpkin decoration, Country Living is an idea millionaire. 2. 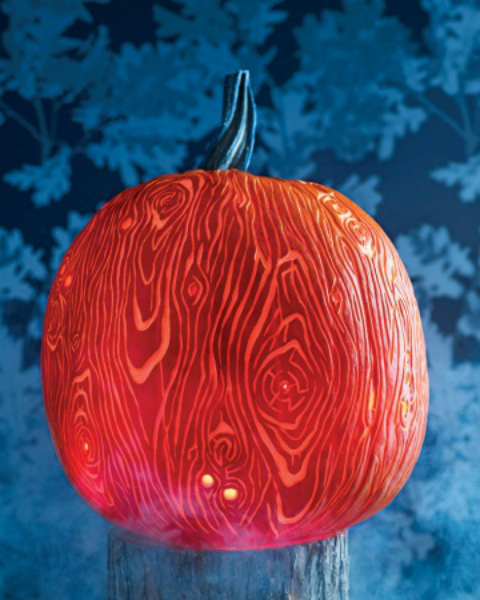 Faux bois carved pumpkin by Martha Stewart Living. Honestly, if you're looking for something classy, clean, and utterly top notch, you can't go wrong with any of the projects put forth by Martha Stewart Living. I'm sure I don't have to tell you that this little faux bois pumpkin is only one of a hundred stellar Halloween offerings. Cute, creepy, whatever. Martha's people cover all their bases. 3. 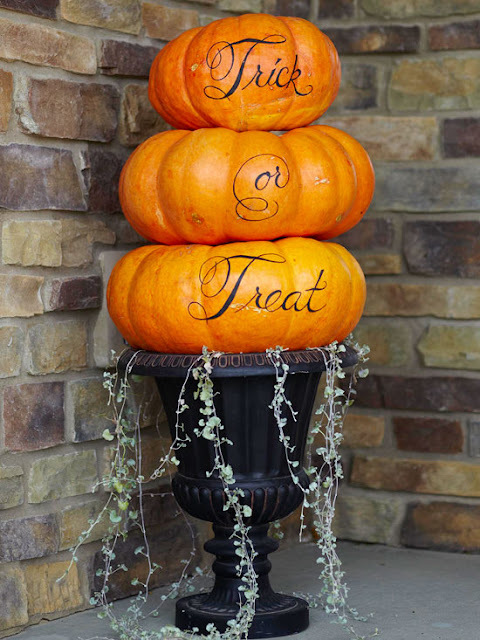 Fancy Trick or Treat stacked pumpkins by Better Homes and Gardens. So, you're not a big carver. No problem. These pumpkins require minimal effort and have a hefty impact. BHG provides the font template and all you need is transfer paper. Totally simple. 4. 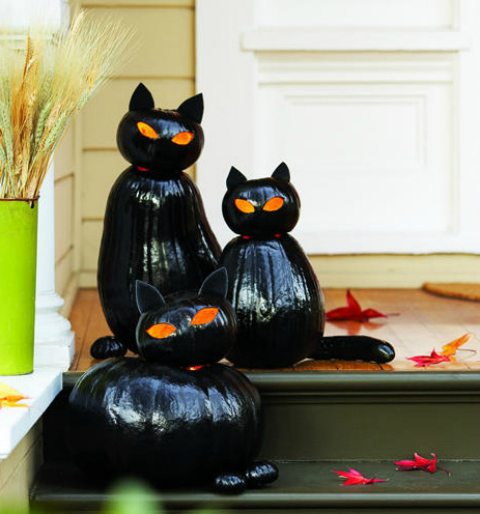 Adorable cat o'lanterns by Sunset magazine! So glossy and sweet. So cautious and slightly aloof. Just like real kitties. Oh! And just imagine how scary their glowing eyes would be on a dark porch. Bonus. 5. 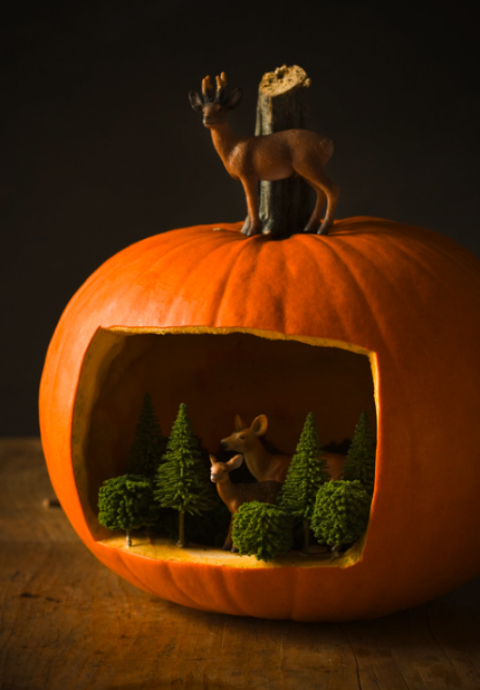 Forest scene pumpkin by Sweet Paul. This is a seriously dream worthy pumpkin, folks. And if you're like the Nicolai sisters, you have about a thousand little animals and trees just hanging out on bookshelves and coffee tables. Put those miniatures to work inhabiting a pumpkin world of your creation. Now, go forth and make amazing pumpkins. You'll be the coolest house on the block. So cool, in fact, that no one would dare to steal your pumpkins to smash them in the street. I mean, these are pumpkins even a hooligan would appreciate.